The Tuesday Tussle; the biggest illustrators squaring off against pops biggest icons - icons you thought they'd never touch. 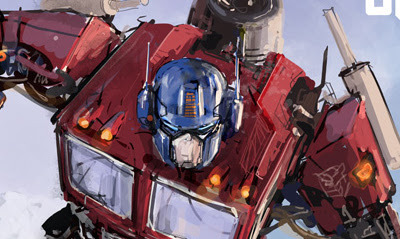 This week Lenil Francis Yu, one of the definitive Wolverine artists of recent times, rolls out his digital vision of Autobot one-man-army; Optimus Prime. Fight! WINNER: Lenil Yu. This isn't just a Prime sketch, it looks like a pitch for a whole new series! Forget the artillery he's packing, lets see that Bumblebee do a one armed push up in the snow! More Lenil Francis Yu after the jump. Now that one's just plain amazing. Almost makes me want to break the tape on my 25th Anniversary Optimus and pull him out of the box. Almost. Almost! Optimus Prime was my favourite toy when I was a kid. Didn't use the trailer much just him. Though I always wanted to see him pick the trailer up and use it like a baseball bat against Megatron - that would've been all kinds of cool! Glad you liked the sketch! Lenil has a wild sketchy style isn these speed paintings that almost suit Wolvie better than the hard line version that saw print. I wasn't a fan of the original trailer either. I thought it was a real cop-out. Hasbro/Takara could have gone so much farther with it, making the slide-in exo suit like they did for Ultra Magnus just a few short years later or even making it transform into a four-legged sidekick (Optimus and Battle Cat anyone?). 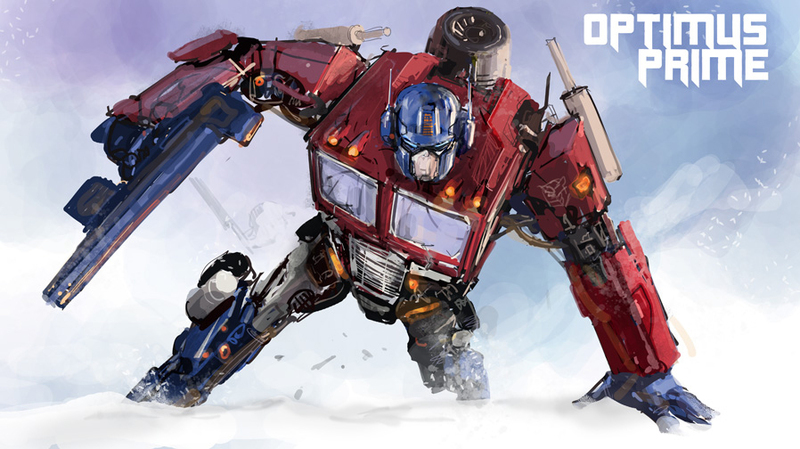 I still like this design better than the movie Optimus. It's cleaner and in my opinion just a better design. Yeah - the 'lotsa noodles wire' look of the movies I think was a big blow. I still hope down the road when the movie franchise is rebooted they do robots that look like the toys at least in robot form. Imagine Devastator on the big screen! I can't Dan. The wound is still too fresh. Maybe over time I'll be able to look at the Constructicons without cringing.